Sometime around 1032 Hereward the Wake was born. The exact year of his birth is uncertain, as is that of his death which is thought to have been 1072. Hereward was the son of Leofric, the Earl of Mercia and his mother was Lady Godiva of Coventry. He was the uncle of Edwin and Morcar who were the last surviving members of the English royal house and the Domesday Book confirms that he held lands in Warwickshire - including Weddington - and Worcestershire. Later he became a leader of the English resistance to William the Conqueror in 1070. The Normans had been here only since 1066 and thoughts and wishes of expelling them remained strong - if futile historically. At the time, there were Danish forces throughout the eastern part of England. King Alfred the Great had ceded the eastern part of England to the invading Norsemen in 901. This region, known as Danelaw, extended from the east of a line drawn from London to Chester. Not until Edward the Confessor became king did an Anglo-Saxon rule again. It was Edward's death in 1066 that precipitated the final crisis during which England effectively joined Europe - by force of invasion, under William, later known as the Conqueror. The brute fact was that the Anglo-Saxon kingdom was enfeebled and defunct, impotent to resist the organised strength of the Normans. Before his death, Edward the Confessor had promised the crown to Duke William of Normandy - there were close family links between the two men - but Anglo-Saxon custom held this to be invalid. Harold Godwinsson was elected in accordance with custom; he happened also to possess large estates in Lincolnshire. William invaded to claim the kingdom. The result of this action is well known: at the Battle of Hastings Harold died with an arrow in his eye and Duke William of Normandy became King William. In Domesday, Danes and Anglo-Saxons, listed as thanes, were still under-tenants of Normans – in Hereward’s case to Count Meulan. This would rankle not just because of dispossession but for the reason that under-tenancy incurred a debt of military duty to the lord - who would, of course, have been a Norman. It was against this background that Hereward joined with a band of Danes, i.e. 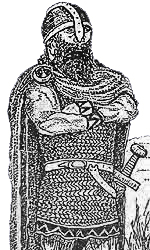 Norsemen, who were based on the Isle of Ely. Over the years the invaders had settled, the conquering impulse had waned, and their power diminished. But together they attacked Peterborough and sacked the abbey there. Hereward was joined by other English refugees; Morcar, Earl of Northumbria, and Aethelwine, Bishop of Durham. Hereward and his raiders were such a threat to William's control of the area that William made a treaty with the Danish king, Sweyn, who as a result withdrew his raiders from Ely. However, Hereward remained, and Ely became for a time refuge for William's enemies. Looking back, it is clear that there was no realistic prospect of ridding the country of the Normans: their forces were united and stronger than anything the English could oppose them with. The complete replacement of the power structure, the importation of a different language and customs, as well as a legal system, succeeded in creating a new England. Despite this, Hereward carried on guerrilla warfare against William, who laid siege to Ely in 1071. Most of the garrison surrendered, but Hereward escaped into the fen country inland and disappeared from history. He became an English folk hero and the subject of many popular legends; according to one he was pardoned, according to another he was killed by the Normans. Charles Kingsley gathered some of them together in his novel 'Hereward the Wake'. The epithet 'the Wake' is obscure both in origin and in meaning. It was apparently first used by the chronicler, John of Peterborough. Its meaning can only be guessed at: perhaps it is meant to indicate he was 'awake' and alert to the Norman danger. One thing is certain, at a time when Weddington is once again under threat, this early English resistance fighter with strong links to the village, deserves wider recognition as part of the community's heritage.